One area of research the Google AI Quantum team pursues is building quantum processors from superconducting electrical circuits, which are attractive candidates for implementing quantum bits (qubits). While superconducting circuits have demonstrated state-of-the-art performance and extensibility to modest processor sizes comprising tens of qubits, an outstanding challenge is stabilizing their performance, which can fluctuate unpredictably. Although performance fluctuations have been observed in numerous superconducting qubit architectures, their origin isn’t well understood, impeding progress in stabilizing processor performance. In “Fluctuations of Energy-Relaxation Times in Superconducting Qubits” published in this week’s Physical Review Letters, we use qubits as probes of their environment to show that performance fluctuations are dominated by material defects. This was done by investigating qubits’ energy relaxation times (T1) — a popular performance metric that gives the length of time that it takes for a qubit to undergo energy-relaxation from its excited to ground state — as a function of operating frequency and time. In measuring T1, we found that some qubit operating frequencies are significantly worse than others, forming energy-relaxation hot-spots (see figure below). Our research suggests that these hot spots are due to material defects, which are themselves quantum systems that can extract energy from qubits when their frequencies overlap (i.e. are “resonant”). Surprisingly, we found that the energy-relaxation hot spots are not static, but “move” on timescales ranging from minutes to hours. From these observations, we concluded that the dynamics of defects’ frequencies into and out of resonance with qubits drives the most significant performance fluctuations. Left: A quantum processor similar to the one that was used to investigate qubit performance fluctuations. One qubit is highlighted in blue. Right: One qubit’s energy-relaxation time “T1” plotted as a function of it’s operating frequency and time. We see energy-relaxation hotspots, which our data suggest are due to material defects (black arrowheads). The motion of these hotspots into and out-of resonance with the qubit are responsible for the most significant energy-relaxation fluctuations. Note that these data were taken over a frequency band with an above-average density of defects. These defects — which are typically referred to as two-level-systems (TLS) — are commonly believed to exist at the material interfaces of superconducting circuits. However, even after decades of research, their microscopic origin still puzzles researchers. In addition to clarifying the origin of qubit performance fluctuations, our data shed light on the physics governing defect dynamics, which is an important piece of this puzzle. Interestingly, from thermodynamics arguments we would not expect the defects that we see to exhibit any dynamics at all. Their energies are about one order of magnitude higher than the thermal energy available in our quantum processor, and so they should be “frozen out.” The fact that they are not frozen out suggests their dynamics may be driven by interactions with other defects that have much lower energies and can thus be thermally activated. The fact that qubits can be used to investigate individual material defects - which are believed to have atomic dimensions, millions of times smaller than our qubits - demonstrates that they are powerful metrological tools. While it’s clear that defect research could help address outstanding problems in materials physics, it’s perhaps surprising that it has direct implications on improving the performance of today’s quantum processors. In fact, defect metrology already informs our processor design and fabrication, and even the mathematical algorithms that we use to avoid defects during quantum processor runtime. We hope this research motivates further work into understanding material defects in superconducting circuits. Multilingual households are becoming increasingly common, with several sources  indicating that multilingual speakers already outnumber monolingual counterparts, and that this number will continue to grow. With this large and increasing population of multilingual users, it is more important than ever that Google develop products that can support multiple languages simultaneously to better serve our users. Today, we’re launching multilingual support for the Google Assistant, which enables users to jump between two different languages across queries, without having to go back to their language settings. Once users select two of the supported languages, English, Spanish, French, German, Italian and Japanese, from there on out they can speak to the Assistant in either language and the Assistant will respond in kind. 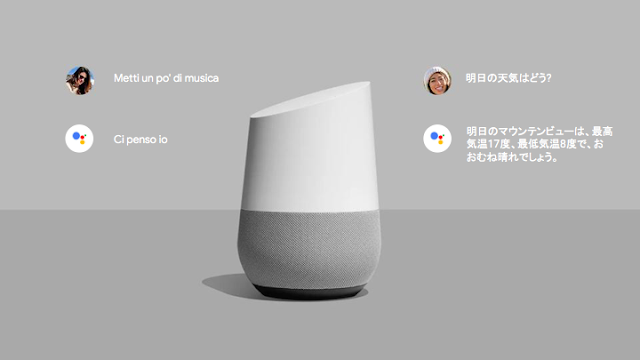 Previously, users had to choose a single language setting for the Assistant, changing their settings each time they wanted to use another language, but now, it’s a simple, hands-free experience for multilingual households. The Google Assistant is now able to identify the language, interpret the query and provide a response using the right language without the user having to touch the Assistant settings. Getting this to work, however, was not a simple feat. In fact, this was a multi-year effort that involved solving a lot of challenging problems. In the end, we broke the problem down into three discrete parts: Identifying Multiple Languages, Understanding Multiple Languages and Optimizing Multilingual Recognition for Google Assistant users. People have the ability to recognize when someone is speaking another language, even if they do not speak the language themselves, just by paying attention to the acoustics of the speech (intonation, phonetic registry, etc). However, defining a computational framework for automatic spoken language recognition is challenging, even with the help of full automatic speech recognition systems1. In 2013, Google started working on spoken language identification (LangID) technology using deep neural networks . Today, our state-of-the-art LangID models can distinguish between pairs of languages in over 2000 alternative language pairs using recurrent neural networks, a family of neural networks which are particularly successful for sequence modeling problems, such as those in speech recognition, voice detection, speaker recognition and others. One of the challenges we ran into was working with larger sets of audio — getting models that can automatically understanding multiple languages at scale, and hitting a quality standard that allowed those models to work properly. To understand more than one language at once, multiple processes need to be run in parallel, each producing incremental results, allowing the Assistant not only to identify the language in which the query is spoken but also to parse the query to create an actionable command. For example, even for a monolingual environment, if a user asks to “set an alarm for 6pm”, the Google Assistant must understand that "set an alarm" implies opening the clock app, fulfilling the explicit parameter of “6pm” and additionally make the inference that the alarm should be set for today. To make this work for any given pair of supported languages is a challenge, as the Assistant executes the same work it does for the monolingual case, but now must additionally enable LangID, and not just one but two monolingual speech recognition systems simultaneously (we’ll explain more about the current two language limitation later in this post). Importantly, the Google Assistant and other services that are referenced in the user’s query asynchronously generate real-time incremental results that need to be evaluated in a matter of milliseconds. This is accomplished with the help of an additional algorithm that ranks the transcription hypotheses provided by each of the two speech recognition systems using the probabilities of the candidate languages produced by LangID, our confidence on the transcription and the user’s preferences (such as favorite artists, for example). Schematic of our multilingual speech recognition system used by the Google Assistant versus the standard monolingual speech recognition system. 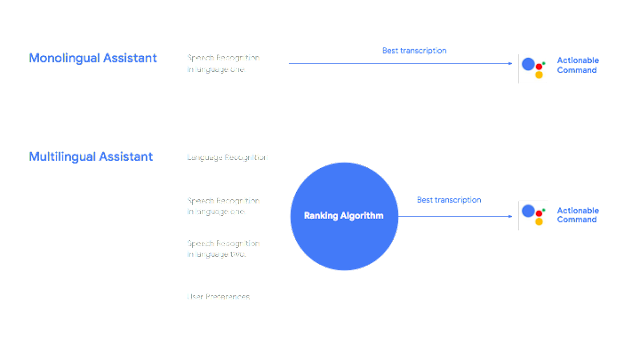 A ranking algorithm is used to select the best recognition hypotheses from two monolingual speech recognizer using relevant information about the user and the incremental langID results. When the user stops speaking, the model has not only determined what language was being spoken, but also what was said. Of course, this process requires a sophisticated architecture that comes with an increased processing cost and the possibility of introducing unnecessary latency. To minimize these undesirable effects, the faster the system can make a decision about which language is being spoken, the better. If the system becomes certain of the language being spoken before the user finishes a query, then it will stop running the user’s speech through the losing recognizer and discard the losing hypothesis, thus lowering the processing cost and reducing any potential latency. With this in mind, we saw several ways of optimizing the system. One use case we considered was that people normally use the same language throughout their query (which is also the language users generally want to hear back from the Assistant), with the exception of asking about entities with names in different languages. This means that, in most cases, focusing on the first part of the query allows the Assistant to make a preliminary guess of the language being spoken, even in sentences containing entities in a different language. With this early identification, the task is simplified by switching to a single monolingual speech recognizer, as we do for monolingual queries. Making a quick decision about how and when to commit to a single language, however, requires a final technological twist: specifically, we use a random forest technique that combines multiple contextual signals, such as the type of device being used, the number of speech hypotheses found, how often we receive similar hypotheses, the uncertainty of the individual speech recognizers, and how frequently each language is used. An additional way we simplified and improved the quality of the system was to limit the list of candidate languages users can select. Users can choose two languages out of the six that our Home devices currently support, which will allow us to support the majority of our multilingual speakers. As we continue to improve our technology, however, we hope to tackle trilingual support next, knowing that this will further enhance the experience of our growing user base. From the beginning, our goal has been to make the Assistant naturally conversational for all users. Multilingual support has been a highly-requested feature, and it’s something our team set its sights on years ago. But there aren’t just a lot of bilingual speakers around the globe today, we also want to make life a little easier for trilingual users, or families that live in homes where more than two languages are spoken. With today’s update, we’re on the right track, and it was made possible by our advanced machine learning, our speech and language recognition technologies, and our team’s commitment to refine our LangID model. We’re now working to teach the Google Assistant how to process more than two languages simultaneously, and are working to add more supported languages in the future — stay tuned! Reinforcement learning (RL) research has seen a number of significant advances over the past few years. These advances have allowed agents to play games at a super-human level — notable examples include DeepMind’s DQN on Atari games along with AlphaGo and AlphaGo Zero, as well as Open AI Five. Specifically, the introduction of replay memories in DQN enabled leveraging previous agent experience, large-scale distributed training enabled distributing the learning process across multiple workers, and distributional methods allowed agents to model full distributions, rather than simply their expected values, to learn a more complete picture of their world. This type of progress is important, as the algorithms yielding these advances are additionally applicable for other domains, such as in robotics (see our recent work on robotic manipulation and teaching robots to visually self-adapt). Quite often, developing these kind of advances requires quickly iterating over a design — often with no clear direction — and disrupting the structure of established methods. However, most existing RL frameworks do not provide the combination of flexibility and stability that enables researchers to iterate on RL methods effectively, and thus explore new research directions that may not have immediately obvious benefits. Further, reproducing the results from existing frameworks is often too time consuming, which can lead to scientific reproducibility issues down the line. Today we’re introducing a new Tensorflow-based framework that aims to provide flexibility, stability, and reproducibility for new and experienced RL researchers alike. Inspired by one of the main components in reward-motivated behaviour in the brain and reflecting the strong historical connection between neuroscience and reinforcement learning research, this platform aims to enable the kind of speculative research that can drive radical discoveries. This release also includes a set of colabs that clarify how to use our framework. Clarity and simplicity are two key considerations in the design of this framework. The code we provide is compact (about 15 Python files) and is well-documented. 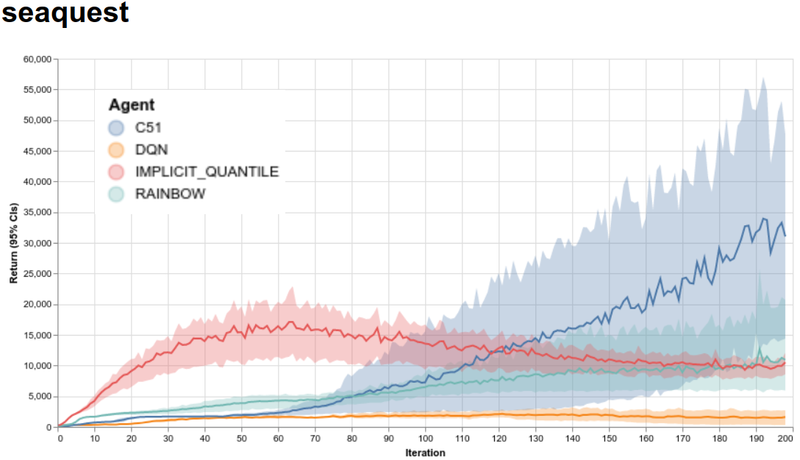 This is achieved by focusing on the Arcade Learning Environment (a mature, well-understood benchmark), and four value-based agents: DQN, C51, a carefully curated simplified variant of the Rainbow agent, and the Implicit Quantile Network agent, which was presented only last month at the International Conference on Machine Learning (ICML). We hope this simplicity makes it easy for researchers to understand the inner workings of the agent and to quickly try out new ideas. We are particularly sensitive to the importance of reproducibility in reinforcement learning research. To this end, we provide our code with full test coverage; these tests also serve as an additional form of documentation. Furthermore, our experimental framework follows the recommendations given by Machado et al. (2018) on standardizing empirical evaluation with the Arcade Learning Environment. It is important for new researchers to be able to quickly benchmark their ideas against established methods. As such, we are providing the full training data of the four provided agents, across the 60 games supported by the Arcade Learning Environment, available as Python pickle files (for agents trained with our framework) and as JSON data files (for comparison with agents trained in other frameworks); we additionally provide a website where you can quickly visualize the training runs for all provided agents on all 60 games. Below we show the training runs for our 4 agents on Seaquest, one of the Atari 2600 games supported by the Arcade Learning Environment. The training runs for our 4 agents on Seaquest. The x-axis represents iterations, where each iteration is 1 million game frames (4.5 hours of real-time play); the y-axis is the average score obtained per play. The shaded areas show confidence intervals from 5 independent runs. We are also providing the trained deep networks from these agents, the raw statistics logs, as well as the Tensorflow event files for plotting with Tensorboard. These can all be found in the downloads section of our site. Our hope is that our framework’s flexibility and ease-of-use will empower researchers to try out new ideas, both incremental and radical. We are already actively using it for our research and finding it is giving us the flexibility to iterate quickly over many ideas. We’re excited to see what the larger community can make of it. Check it out at our github repo, play with it, and let us know what you think! This project was only possible thanks to several collaborations at Google. The core team includes Marc G. Bellemare, Pablo Samuel Castro, Carles Gelada, Subhodeep Moitra and Saurabh Kumar. We also extend a special thanks to Sergio Guadamarra, Ofir Nachum, Yifan Wu, Clare Lyle, Liam Fedus, Kelvin Xu, Emilio Parisoto, Hado van Hasselt, Georg Ostrovski and Will Dabney, and the many people at Google who helped us test it out. Last year we released the Transformer, a new machine learning model that showed remarkable success over existing algorithms for machine translation and other language understanding tasks. Before the Transformer, most neural network based approaches to machine translation relied on recurrent neural networks (RNNs) which operate sequentially (e.g. translating words in a sentence one-after-the-other) using recurrence (i.e. the output of each step feeds into the next). While RNNs are very powerful at modeling sequences, their sequential nature means that they are quite slow to train, as longer sentences need more processing steps, and their recurrent structure also makes them notoriously difficult to train properly. In contrast to RNN-based approaches, the Transformer used no recurrence, instead processing all words or symbols in the sequence in parallel while making use of a self-attention mechanism to incorporate context from words farther away. By processing all words in parallel and letting each word attend to other words in the sentence over multiple processing steps, the Transformer was much faster to train than recurrent models. Remarkably, it also yielded much better translation results than RNNs. However, on smaller and more structured language understanding tasks, or even simple algorithmic tasks such as copying a string (e.g. to transform an input of “abc” to “abcabc”), the Transformer does not perform very well. In contrast, models that perform well on these tasks, like the Neural GPU and Neural Turing Machine, fail on large-scale language understanding tasks like translation. In “Universal Transformers” we extend the standard Transformer to be computationally universal (Turing complete) using a novel, efficient flavor of parallel-in-time recurrence which yields stronger results across a wider range of tasks. We built on the parallel structure of the Transformer to retain its fast training speed, but we replaced the Transformer’s fixed stack of different transformation functions with several applications of a single, parallel-in-time recurrent transformation function (i.e. the same learned transformation function is applied to all symbols in parallel over multiple processing steps, where the output of each step feeds into the next). Crucially, where an RNN processes a sequence symbol-by-symbol (left to right), the Universal Transformer processes all symbols at the same time (like the Transformer), but then refines its interpretation of every symbol in parallel over a variable number of recurrent processing steps using self-attention. This parallel-in-time recurrence mechanism is both faster than the serial recurrence used in RNNs, and also makes the Universal Transformer more powerful than the standard feedforward Transformer. The Universal Transformer repeatedly refines a series of vector representations (shown as h1 to hm) for each position of the sequence in parallel, by combining information from different positions using self-attention and applying a recurrent transition function. Arrows denote dependencies between operations. At each step, information is communicated from each symbol (e.g. word in the sentence) to all other symbols using self-attention, just like in the original Transformer. However, now the number of times this transformation is applied to each symbol (i.e. the number of recurrent steps) can either be manually set ahead of time (e.g. to some fixed number or to the input length), or it can be decided dynamically by the Universal Transformer itself. To achieve the latter, we added an adaptive computation mechanism to each position which can allocate more processing steps to symbols that are more ambiguous or require more computations. As an intuitive example of how this could be useful, consider the sentence “I arrived at the bank after crossing the river”. In this case, more context is required to infer the most likely meaning of the word “bank” compared to the less ambiguous meaning of “I” or “river”. When we encode this sentence using the standard Transformer, the same amount of computation is applied unconditionally to each word. However, the Universal Transformer’s adaptive mechanism allows the model to spend increased computation only on the more ambiguous words, e.g. to use more steps to integrate the additional contextual information needed to disambiguate the word “bank”, while spending potentially fewer steps on less ambiguous words. At first it might seem restrictive to allow the Universal Transformer to only apply a single learned function repeatedly to process its input, especially when compared to the standard Transformer which learns to apply a fixed sequence of distinct functions. But learning how to apply a single function repeatedly means the number of applications (processing steps) can now be variable, and this is the crucial difference. Beyond allowing the Universal Transformer to apply more computation to more ambiguous symbols, as explained above, it further allows the model to scale the number of function applications with the overall size of the input (more steps for longer sequences), or to decide dynamically how often to apply the function to any given part of the input based on other characteristics learned during training. This makes the Universal Transformer more powerful in a theoretical sense, as it can effectively learn to apply different transformations to different parts of the input. This is something that the standard Transformer cannot do, as it consists of fixed stacks of learned Transformation blocks applied only once. But while increased theoretical power is desirable, we also care about empirical performance. Our experiments confirm that Universal Transformers are indeed able to learn from examples how to copy and reverse strings and how to perform integer addition much better than a Transformer or an RNN (although not quite as well as Neural GPUs). Furthermore, on a diverse set of challenging language understanding tasks the Universal Transformer generalizes significantly better and achieves a new state of the art on the bAbI linguistic reasoning task and the challenging LAMBADA language modeling task. But perhaps of most interest is that the Universal Transformer also improves translation quality by 0.9 BLEU1 over a base Transformer with the same number of parameters, trained in the same way on the same training data. Putting things in perspective, this almost adds another 50% relative improvement on top of the previous 2.0 BLEU improvement that the original Transformer showed over earlier models when it was released last year. The Universal Transformer thus closes the gap between practical sequence models competitive on large-scale language understanding tasks such as machine translation, and computationally universal models such as the Neural Turing Machine or the Neural GPU, which can be trained using gradient descent to perform arbitrary algorithmic tasks. We are enthusiastic about recent developments on parallel-in-time sequence models, and in addition to adding computational capacity and recurrence in processing depth, we hope that further improvements to the basic Universal Transformer presented here will help us build learning algorithms that are both more powerful, more data efficient, and that generalize beyond the current state-of-the-art. If you’d like to try this for yourself, the code used to train and evaluate Universal Transformers can be found here in the open-source Tensor2Tensor repository. This research was conducted by Mostafa Dehghani, Stephan Gouws, Oriol Vinyals, Jakob Uszkoreit, and Łukasz Kaiser. Additional thanks go to Ashish Vaswani, Douglas Eck, and David Dohan for their fruitful comments and inspiration. Earlier this week we launched Android 9 Pie, the latest release of Android that uses machine learning to make your phone simpler to use. One of the features in Android 9 is Smart Linkify, a new API that adds clickable links when certain types of entities are detected in text. This is useful when, for example, you receive an address from a friend in a messaging app and want to look it up on a map. With a Smart Linkify-annotated text, it’s a lot easier! Smart Linkify is a new version of the existing Android Linkify API. It is powered by a small feed-forward neural network (500kB per language) with low latency (less than 20ms on Google Pixel phones) and small inference code (250kB), and uses essentially the same machine learning technology that powers Smart Text Selection (released as part of Android Oreo) to now also create links. Smart Linkify is available as an open-source TextClassifier API in Android (as the generateLinks method). The models were trained using TensorFlow and exported to a custom inference library backed by TensorFlow Lite and FlatBuffers. The C++ inference library for the models is available as part of Android Open-Source framework here, and runs on each text selection and Smart Linkify API calls. Looking for phone numbers and postal addresses in text is a difficult problem. Not only are there many variations in how people write them, but it’s also often ambiguous what type of entity is being represented (e.g. “Confirmation number: 857-555-3556” is not a phone number even though it it takes a similar form to one). As a solution, we designed an inference algorithm with two small feedforward neural networks at its heart. This algorithm is general enough to perform all kinds of entity chunking beyond just addresses and phone numbers. For the given text string, the first network assigns low scores to non-entities and a high score for the candidate that correctly selects the whole phone number. Next, the generated entities that overlap are removed, favoring the ones with the higher score over the conflicting ones with a lower score. Now, we have a set of entities, but still don’t know their types. 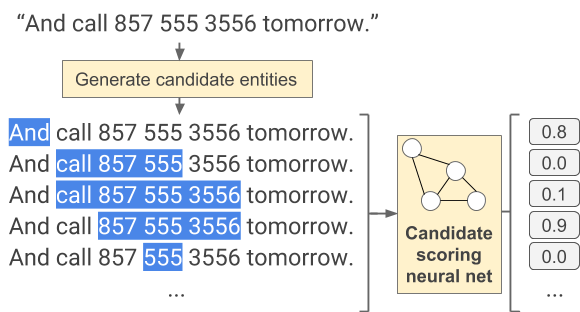 So now the second neural network is used to classify the type of the entity, as either a phone number, address or in some cases, a non-entity. In our example, the only non-conflicting entities are “And call 857 555 3556tomorrow.” (with “857 555 3556” classified as a phone number), and “And call 857 555 3556 tomorrow.” (with “And” classified as a non-entity). Now that we have the only non-conflicting entities, “And call 857 555 3556 tomorrow.” (with “857 555 3556” classified as a phone number) and “And call 857 555 3556 tomorrow.” (with “And” classified as a non-entity), we are easily able to underline them in the displayed text on the screen, and run the right app when clicked. So far, we’ve given a general description of the way Smart Linkify locates and classifies entities in a string of text. Here, we go into more detail on how the text is processed and fed to the network. Given a candidate entity span, we extract: Left context: five words before the entity, Entity start: first three words of the entity, Entity end: last three words of the entity (they can be duplicated with the previous feature if they overlap, or padded if there are not that many), Right context: five words after the entity, Entity content: bag of words inside the entity and Entity length: size of the entity in number of words. They are then concatenated together and fed as an input to the neural network. Character N-grams. Instead of using the standard word embedding technique for representing words, which keeps a separate vector for each word in the model and thus would be infeasible for mobile devices because of their large storage size, we use the hashed charactergram embedding. This technique represents the word as a set of all character subsequences of certain length. We use lengths 1 to 5. These strings are additionally hashed and mapped to a fixed number of buckets (see here for more details on the technique). As a result, the final model only stores vectors for each of the hash buckets, not each word/character subsequence, and can be kept small. The embedding matrix for the hashed charactergrams that we use has 20,000 buckets and 12 dimensions. A binary feature that indicates whether the word starts with a capital letter. This is important for the network to know because the capitalization in postal addresses is quite distinct, and helps the networks to discriminate. There is no obvious dataset for this task on which we could readily train the networks, so we came up with a training algorithm that generates synthetic examples out of realistic pieces. Concretely, we gathered lists of addresses, phone numbers and named entities (like product, place and business names) and other random words from the Web (using Schema.org annotations), and use them to synthesize the training data for the neural networks. We take the entities as they are and generate random textual contexts around them (from the list of random words on Web). Additionally, we add phrases like “Confirmation number:” or “ID:” to the negative training data for phone numbers, to teach the network to suppress phone number matches in these contexts. Quantizing the embedding matrix to 8 bits. We found that we could reduce the size of the model almost 4x without compromising the performance, by quantizing the embedding matrix values to 8-bit integers. Sharing embedding matrices between the selection and classification networks. This brings almost no loss and makes the model 2x smaller. Varying the size of the context before/after the entities. On mobile screens text is often short, with not enough context, so the network needs to be exposed to this during training as well. Creating artificial negative examples out of the positive ones for the classification network. For example for the positive example: “call me 857 555-3556 today” with a label “phone” we generate “call me 857 555-3556 today” as a negative example with a label “other”. This teaches the classification network to be more precise about the entity span. Without doing this, the network would be merely a detector whether there is a phone number somewhere in the input, regardless of the span. The automatic data extraction we use makes it easier to train language-specific models. However, making them work for all languages is a challenge, requiring careful checking of language nuance by experts, as well as having an acceptable amount of training data. We found that having one model for all Latin-script languages works well (e.g. Czech, Polish, German, English), with individual models for each of Chinese, Japanese, Korean, Thai, Arabic and Russian. While Smark Linkify currently supports 16 languages, we are experimenting with models that support even more languages, which is especially challenging given the mobile model size constraints and trickiness with languages that do not split words on spaces. While the technique described in this post enables the fast and accurate annotation of phone numbers and postal addresses in text, the recognition of flight numbers, date and time, or IBAN, is currently implemented with a more traditional technique using standard regular expressions. However, we are looking into creating ML models for date and time as well, particularly for recognizing informal relative date/time specifications prevalent in messaging context, like “next Thursday” or “in 3 weeks”. The small model and binary size as well as low latency are very important for mobile deployment. The models and the code we developed are available open-source as part of Android framework. We believe that the architecture could extend to other on-device text annotation problems and we look forward to seeing new use cases from our developer community! Convolutional neural networks (CNNs) have been widely used in image classification, face recognition, object detection and many other domains. Unfortunately, designing CNNs for mobile devices is challenging because mobile models need to be small and fast, yet still accurate. Although significant effort has been made to design and improve mobile models, such as MobileNet and MobileNetV2, manually creating efficient models remains challenging when there are so many possibilities to consider. Inspired by recent progress in AutoML neural architecture search, we wondered if the design of mobile CNN models could also benefit from an AutoML approach. 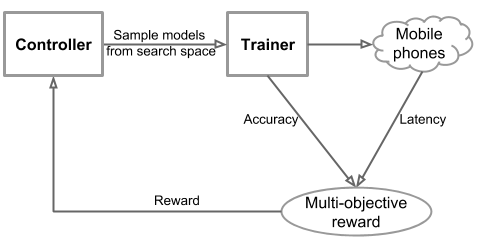 In “MnasNet: Platform-Aware Neural Architecture Search for Mobile”, we explore an automated neural architecture search approach for designing mobile models using reinforcement learning. To deal with mobile speed constraints, we explicitly incorporate the speed information into the main reward function of the search algorithm, so that the search can identify a model that achieves a good trade-off between accuracy and speed. 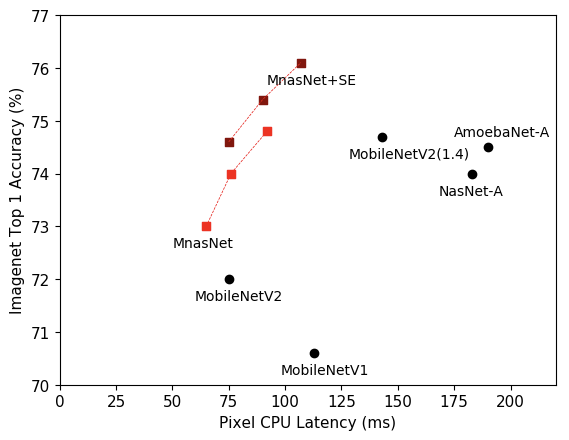 In doing so, MnasNet is able to find models that run 1.5x faster than state-of-the-art hand-crafted MobileNetV2 and 2.4x faster than NASNet, while reaching the same ImageNet top 1 accuracy. Unlike in previous architecture search approaches, where model speed is considered via another proxy (e.g., FLOPS), our approach directly measures model speed by executing the model on a particular platform, e.g., Pixel phones which were used in this research study. In this way, we can directly measure what is achievable in real-world practice, given that each type of mobile device has its own software and hardware idiosyncrasies and may require different architectures for the best trade-offs between accuracy and speed. The overall flow of our approach consists mainly of three components: a RNN-based controller for learning and sampling model architectures, a trainer that builds and trains models to obtain the accuracy, and an inference engine for measuring the model speed on real mobile phones using TensorFlow Lite. We formulate a multi-objective optimization problem that aims to achieve both high accuracy and high speed, and utilize a reinforcement learning algorithm with a customized reward function to find Pareto optimal solutions (e.g., models that have the highest accuracy without worsening speed). Overall flow of our automated neural architecture search approach for Mobile. 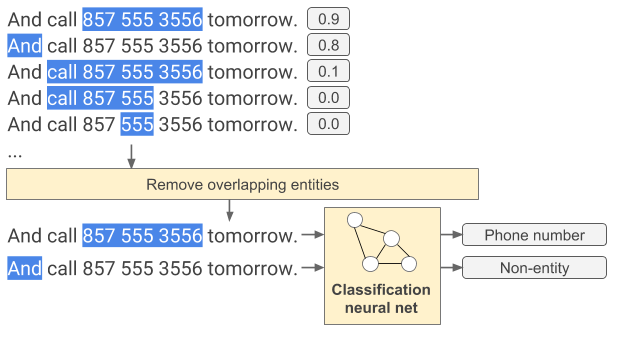 In order to strike the right balance between search flexibility and search space size, we propose a novel factorized hierarchical search space, which factorizes a convolutional neural network into a sequence of blocks, and then uses a hierarchical search space to determine the layer architecture for each block. In this way, our approach allows different layers to use different operations and connections; Meanwhile, we force all layers in each block to share the same structure, thus significantly reducing the search space size by orders of magnitude compared to a flat per-layer search space. Our MnasNet network, sampled from the novel factorized hierarchical search space,illustrating the layer diversity throughout the network architecture. We tested the effectiveness of our approach on ImageNet classification and COCO object detection. Our experiments achieve a new state-of-the-art accuracy under typical mobile speed constraints. In particular, the figure below shows the results on ImageNet. ImageNet Accuracy and Inference Latency comparison. MnasNets are our models. With the same accuracy, our MnasNet model runs 1.5x faster than the hand-crafted state-of-the-art MobileNetV2, and 2.4x faster than NASNet, which also used architecture search. After applying the squeeze-and-excitation optimization, our MnasNet+SE models achieve ResNet-50 level top-1 accuracy at 76.1%, with 19x fewer parameters and 10x fewer multiply-adds operations. On COCO object detection, our model family achieves both higher accuracy and higher speed than MobileNet, and achieves comparable accuracy to the SSD300 model with 35x less computation cost. We are pleased to see that our automated approach can achieve state-of-the-art performance on multiple complex mobile vision tasks. In the future, we plan to incorporate more operations and optimizations into our search space, and apply it to more mobile vision tasks such as semantic segmentation. Special thanks to the co-authors of the paper Bo Chen, Quoc V. Le, Ruoming Pang and Vijay Vasudevan. We’d also like to thank Andrew Howard, Barret Zoph, Dmitry Kalenichenko, Guiheng Zhou, Jeff Dean, Mark Sandler, Megan Kacholia, Sheng Li, Vishy Tirumalashetty, Wen Wang, Xiaoqiang Zheng and Yifeng Lu for their help, and the TensorFlow Lite and Google Brain teams.